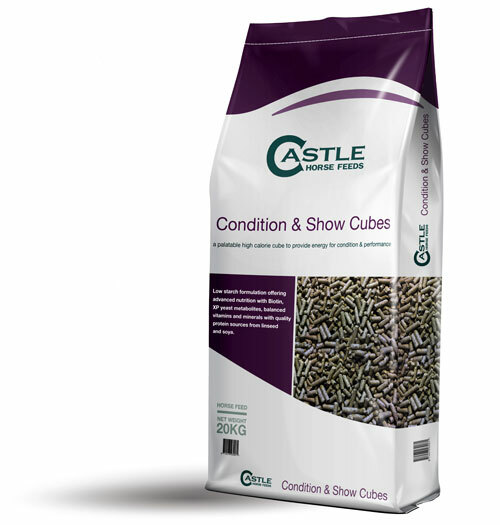 A high-specification cube delivering advanced nutrition to support condition and performance. 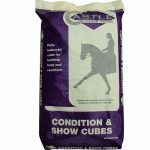 It provides elevated energy and protein and is suitable for horses and ponies needing extra condition and those in regular, more intense work. Wheatfeed; High Fibre Oat By-Product; Linseed Expeller; Molasses; Soya bean meal; Maize; Grass, dried; Full Fat Linseed Meal; Soya Oil; Calcium Carbonate; Vitamin Premix; Sodium Chloride; Yeast Product (Diamond V XPC); Monocalcium Phosphate. 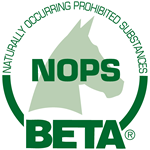 Feeding Rate: 400 – 800 gm per 100Kg of horse’s weight, depending on condition and work done.